The Berkeley Square homeowner with the most serious interest in architecture was likely the man who built #18, one of the most sophisticated and distinctive houses on the street. Dr. Robert Phillips McReynolds seems to have been a man of varied interests—everything from human reproduction to the marketing of dry goods to sophisticated trends in design. Born in 1871 in the Kentucky town of Elkton—closer to Nashville than Louisville—his background seems as though it would have been enough to send anyone with an iota of a sense of the larger world high-tailing it out of a one-horse town, to at least as far as the continent would allow: His fundamentalist parents were strict and unyielding in terms of moral behavior; his father, a rich surgeon and planter in Elkton, was considered by locals to be insufferably high-handed and snobbish. 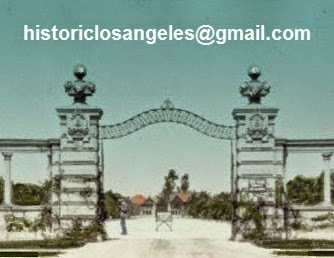 One imagines the transformative allure of turn-of-the-century Los Angeles for an intelligent and adventurous young man from a benighted Southern bog who had received his M.D. from the University of Pennsylvania in 1895, had studied obstetrics at schools in Europe, and was practicing in Philadelphia before arriving in Los Angeles at age 35. But his move west seems to have been more geographic than a bid for freedom from pulpitudinous oppression. 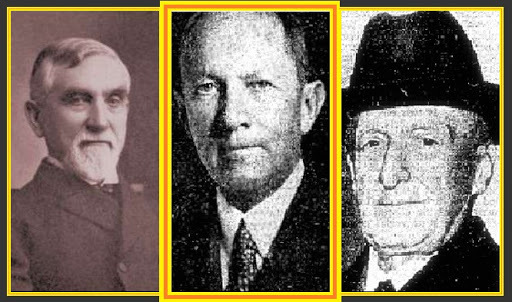 It appears that through the Disciples of Christ young Dr. McReynolds already knew the shopkeeping Coulter family of Kentucky before arriving in Los Angeles in 1906 to marry the only daughter of Benjamin Franklin Coulter, better known as B. F., a key member of his clan who had come to California 30 years before to establish a hardware store followed by a famous dry-goods emporium in 1878—a timeline that by L.A. standards would qualify his family as pioneer stock. Robert and Frances were married at high noon on December 12, 1906; a report of the wedding appeared the next morning on the front page of the Herald, prominently above the fold, complete with pictures of the bride and groom. Court from 1914 to 1941, couldn't face it. Frances Coulter was not from a family of agnostics or layabouts—far from it. A man whose multi-tasking ways would be an inspiration to his new son-in-law, her father was not only an energetic merchant but an ordained minister. His great success with Coulter's Dry Goods Company, the hallmark of which was always attentive customer service, allowed him to finance several houses of worship, including one for the Disciples of Christ on Temple Street in 1881, which he then headed for the next three years. He was also able to build a grand house on Grand Street atop Bunker Hill, fashion's neighborhood of choice before the development of West Adams. 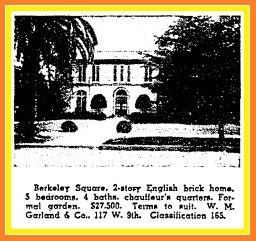 It was at 219 North Grand, a short walk to store, church, and medical office, that newlyweds Robert and Frances lived for a time with her parents, soon buying Lot 20 in Berkeley Square. Not that a well-connected obstetrician might not have been able to afford it himself, but one wonders how much of a dowry B.F. might have provided to make his daughter and son-in-law's new house possible—whether bound by money, religion, or their Kentucky roots, clearly this was a unified family. In any case, not only did Robert choose to build in the choicest new subdivision in town, but he had the aesthetic sensibility to seek out the design services of architect Robert D. Farquhar early in his career—a man whose paradoxically powerful but delicate way with bricks would result in some of the most beautiful buildings in Los Angeles—#18 as well as the still-extant downtown California Club and Clark Memorial Library in West Adams among them. The Department of Buildings issued McReynolds a permit to begin construction on August 25, 1909.
view at right of furniture merchant E.J. Brent's #20. 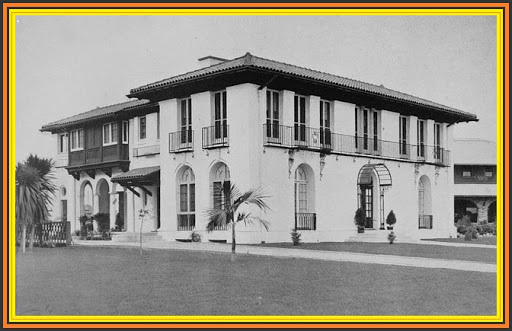 In 1913 Homes and Gardens of the Pacific Coast described the house Farquhar designed for the McReynoldses in 1909 as "a very attractive example of...Colonial architecture.... The long French windows arched on the first floor, with the iron balcony on the second floor are particularly pleasing. The hooded entrance is a very interesting feature of the house. The interior is finished in hardwood and mahogany, the second story being in white enamel. The furnishings have been carried along the style of the architecture, with many pieces of fine statuary and old armour." I don't know about the statuary and armor, which don't jive with the clean anti-Victorian symmetry of the exterior, but perhaps the remodelings by Pasadena's esteemed firm of Greene & Greene between 1912 and 1916, mostly of the interior—followed by a few changes in the mid '20s by Henry Greene alone—were intended to clear the dust-catching detritus away. Within three years of its founding, the coffers of Coulter's Dry Goods were churning to the extent that the Reverend B.F. Coulter was able to fund the Temple Street Christian Church; a year after that congregation moved to Hope and 11th streets in 1894, the store's cash trolleys were zipping along their cables at such a rate that B.F. was able to build the offshoot Broadway Church of Christ, which he headed until his death in 1911. In honor of Coulter, a later Disciples of Christ church at Pico and Arlington was called the Coulter Memorial. 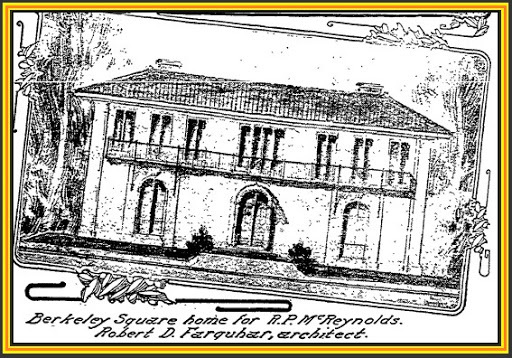 After B.F.'s death, his widow Alice was to move into #18 Berkeley Square to live with her daughter and son-in-law; in an early and rare instance of distaff executive power, she also assumed the presidency of Coulter's Dry Goods, albeit later with the help of Dr. McReynolds, who was to officially succeed her at the helm in 1924. While a household of greater industry than some on the Square, #18 was to follow the standard haute bourgeois template when it came to entertaining. 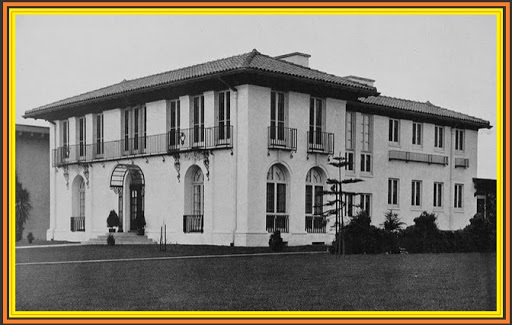 One soirée in 1940 honored the newly married Erle P. Halliburton Jr., whose parents lived across the street at #19; there were also luncheons, teas, dinner dances, musicales, and a wedding reception, the latter for the McReynoldses' daughter Alice Cornelia in October 1930. Interestingly, the family chose to have the ceremony not at the new church dedicated to B.F. Coulter, of which they were members, but at St. John's at Adams and Figueroa, the Episcopal church of the Blue Book set. The Disciples of Christ back in Tennessee must have shuddered at such heretical worldliness out in Hollywood. Eleven years later, Alice's brother Robert Coulter McReynolds married Jeanne Hobgood, described impressively by the Times as "prominent in society circles at home in Concho, Oklahoma," in a Presbyterian ceremony. Alice remained married to Edwin L. Harbach until he died a few months before her in 1982 (the couple lived for many years at 322 Lorraine Boulevard in Windsor Square); Robert, later a marine physicist with the Scripps Institution of Oceanography, divorced Jeanne and had three more wives. Jeanne, mother of Robert Coulter McReynolds Jr., went on to marry one of the ex-husbands of King Vidor's daughter Suzanne, whose mother married violinist Jascha Heifetz after divorcing Vidor. Corpses in Tennessee graves spun even faster, which was probably more fun than they ever had while alive. An interesting if reprehensible character in the form of an Associate Justice of the U.S. Supreme Court visited his brother at #18 Berkeley Square on occasion over the years. James Clark McReynolds served on the court from 1914 to 1941, during which time he managed, like his father, to charm no one, even in those less enlightened times, with his blatant anti-Semitism, racism, and misogyny that makes even he of the hirsute Coke can seem almost acceptable. Drew Pearson called him "Scrooge"; Chief Justice William Howard Taft thought him grouchy and priggish (McReynolds considered men who wore wrist watches to be "fruits" and women who wore red nail polish to be vulgar strumpets). Taft also thought that his cohort could be irresponsible in matters of Court business, especially during duck-hunting season, as well as selfish and "fuller of prejudice than any man I know." Justice McReynolds refused to speak to or sit next to Justice Louis Brandeis, and when Benjamin Cardozo was appointed to the court, he urged the White House "not to afflict the Court with another Jew"—this ignorant appeal coming after years of his virulent opposition to any New Deal legislation and once having called Roosevelt "Nero at his worst." Not to put too fine a point on it, but other characterizations of McReynolds included boorish, rude, impatient, angry, mean, sarcastic, intolerant, petty, reactionary, and Puritanical. In other words, a real charmer. While he did leave his estate to charity and some kindnesses, tellingly always to strangers, are attributed to him, the lifelong bachelor—oh the Freudian inquiry that could be made on just that one item—died alone in 1946, with no friends or family in attendance, the world mercifully having made an effort to leave his sort of inflexible, antediluvian mindset behind. Not a single Supreme Court justice attended his funeral; when his frequently demeaned African-American factotum Harry Parker—who was sometimes used by the Justice as a human bird dog on hunting trips and who was always outwardly respectful but who along with others referred to McReynolds as "Pussywillow" behind his back—died seven years later, his memorial service drew Chief Justice Vinson and five Associates. Coulter's Dry Goods was now Coulter's Department Store. Back in Los Angeles, Alice Coulter had died at #18 in 1937 at age 86, with services at the Coulter Memorial. 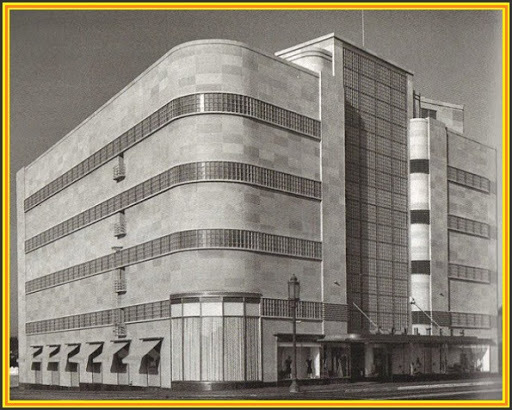 Firmly at the helm of Coulter's Dry Goods, and ever cognizant of design and retail trends, Robert McReynolds commissioned the estimable Stiles O. Clements to design a new store for the firm on Wilshire Boulevard. Just as residents of West Adams, including of course Berkeley Square, were moving north and west out the new Wilshire spine, so too had many downtown merchants established branches on the Boulevard over the prior decade. But lone among downtown merchants, McReynolds made the brave and prescient decision not to build a branch store for Coulter's on the Miracle Mile but to move the flagship there, leaving downtown Los Angeles altogether. Berkeley Square for another 15 years. After Alice's death, #18 was put on the market. Whether Robert and Frances had a change of heart or whether plans for the new store and the slump of 1938 complicated a sale is not known, but the family was to retain ownership into the '50s. Frances Coulter McReynolds, clubwoman and patroness of the Los Angeles Philharmonic, died at Good Samaritan in 1942, a native Angeleno who had been born in her parents' house on Bunker Hill in 1882. Robert continued as president of Coulter's Dry Goods until stepping down in May 1951 after 27 years; his son James O. McReynolds—who once attended a 50th anniversary party dressed as a gold Cadillac Eldorado (get it?) with hubcap as hat—took over store reins at that time. After a series of abdominal operations begun several months later, Robert lingered until December 19, 1952. 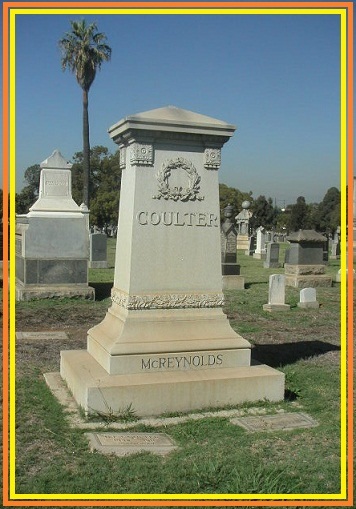 After services attended by hundreds at the Arlington Avenue Christian Church—the Coulter Memorial—he was buried alongside Frances and her parents in the venerable Evergreen Cemetery in Boyle Heights. Only one other family besides the McReynoldses lived at #18 Berkeley Square in its 54 years. Hong Wong was listed in city directories there for the seven years after 1955. The address disappears after 1962, the same year the photograph at top was taken. The school board had acquired most of the south side of the Square for expansion; on June 3, 1963, it was issued a permit by the Department of Building and Safety to demolish #18.